Donna Designs Wearable Art ... One of a Kind, One at a Time. 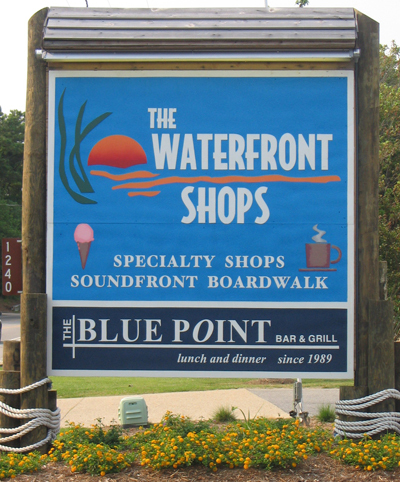 Come see us at the Waterfront Shops in Duck. Originally from Hopewell, Virginia, Donna Haddon spent her summer vacations on the beaches of North Carolina as far back as she can remember. She began drawing and painting as a child and was drawn to nature as a main source of ideas, colors and patterns. As an artist, her longing for the beauty of the Outer Banks and the inspiration that it brings became a reality when she moved there in her early twenties. In 1976, she discovered a way to combine her art and entrepreneurial drive when she began creating designs on ladies fashion tops and wholesaling them at trade shows up and down the east coast. Back then, she would load everything into her minivan and head off to Orlando, Atlantic City, and New York City, and would come home with more orders than she knew what to do with. In a few short years she was selling to accounts across the United States and even in the Caribbean. Eventually, in 1986, Donna decided to open her own retail store and currently sells her designs exclusively in her Donna Designs location in the Waterfront Shops in Duck, North Carolina. Even as her business was growing, Donna still found time to paint and explore other media. Using watercolor and acrylic she created a series of flowers and butterfly wings on canvas and paper. 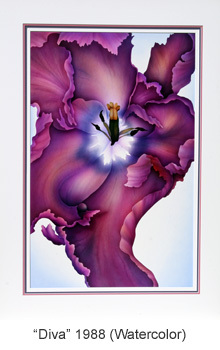 An airbrushed watercolor of a tulip beginning to wilt, won an Award of Excellence and the People’s Choice Award at the Frank Stick Memorial Art Show in 1988. Donna has also used numerous techniques to paint on clothing, including free hand, batik, airbrush and gyotaku. Gyotaku is a process originating in Japan in the early 1800’s. 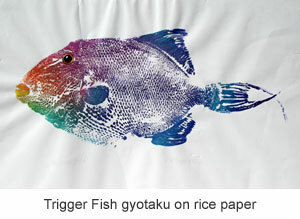 The word gyotaku means fish rubbing [gyo=fish, taku=rubbing]. 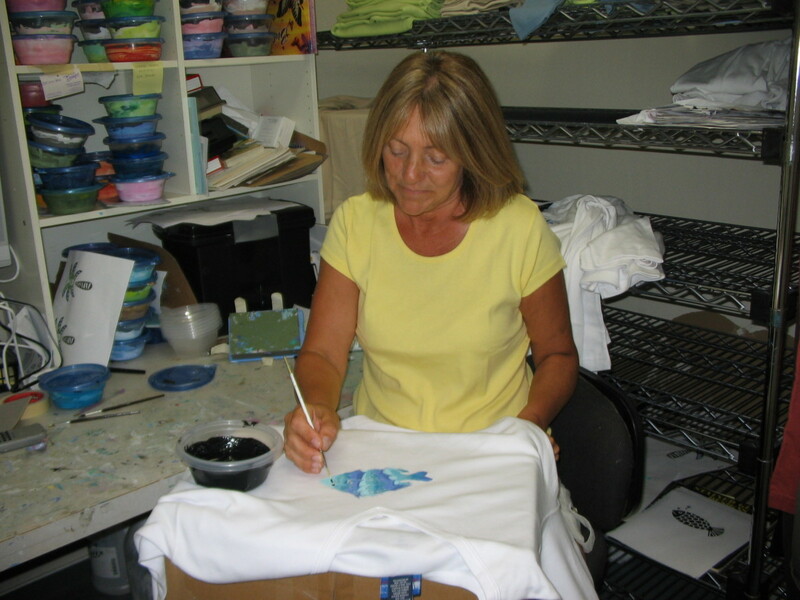 Donna paints a real fish first and then places the shirt over the fish to transfer the colors, resulting in a print that reveals the intricate patterns in the scales, fins and tail. The fish can then be repainted and used again to print. She has also lifted the prints onto rice paper for a work of art ready for framing. One of her favorite ways to paint on fabric is using a method that she developed on her own. She perfected this process over the years, allowing her to swirl the colors creating an ever changing design as she moves from one shirt to another. It’s much like a cross between block print and screen print. She mixes a new batch of paint, using a fabric binder, for each run of about two dozen shirts. This contributes to the unique variations in the designs. The shirts are then heat set to lock the color into the fabric, resulting in a durable piece of wearable art. Donna is continually creating new designs that change with the seasons and her own artistic sensibilities. Color has always been important to me. I remember things by color and I’m drawn to patterns in nature. I think it’s my use of color that has been bringing customers back year after year. If she doesn’t have a paintbrush in her hand, she will almost certainly have a camera to capture a magical image. In Donna’s collection you will find her latest inspirations, including pictures of waterfowl, flowers, butterflies and sunsets, as well as her children and grandchildren. The wildlife on the Outer Banks, fascinates Donna; from loggerhead turtles and dolphins to the monarch butterflies that migrate through in the fall. She and her daughter, Kaelyn, rear monarch butterflies and tag them during this migration. Donna painted butterflies on the horse that stands at the entrance to the Waterfront Shops. This horse was part of a 2003 community-wide project, the Winged Horse Extravaganza, that commemorated the 100th Anniversary of the Wright Brothers First Flight here on the Outer Banks. Tom, Donna’s husband, of Haddon Homes, Inc., is a custom home builder. He is currently serving as Co-chair of the Green Building Council at the Outer Banks Homebuilder’s Association. Donna’s three children, Marye, Jonathan and Kaelyn, have displayed their own creative talents from an early age. Marye grew up in the business, travelling to trade shows and eventually managing Donna Designs. She graduated from East Carolina University in fabric design. Today, she keeps busy designing kitchens in Virginia Beach, where she lives with her husband, David, and sons Jeb and Seth. Jeb and Seth love to watch DeDe (Donna), with her butterflies and assist with releasing them. She has also incorporated their handprints and footprints into some of her designs. Jonathan is a graduate of the Culinary Institute of America in Hyde Park, New York. His passion is combining ingredients to create his own unique dishes. He was fortunate enough to get his start working under Wes Step at Red Sky Cafe, right here in Duck. Jonathan has also worked at Caneel Bay Resort in St. John, U.S. Virgin Islands and the Country Club of Darien in Darien, Connecticut. He is currently the head chef in Connecticut. Kaelyn, the youngest, a graduate from N.C. State, is quite the artist and has already helped her mom with t-shirt designs. Check out her award winning painting on the butterfly page. Come See Us at the Waterfront Shops! © Donna Haddon, Donna Designs. All text and images protected.